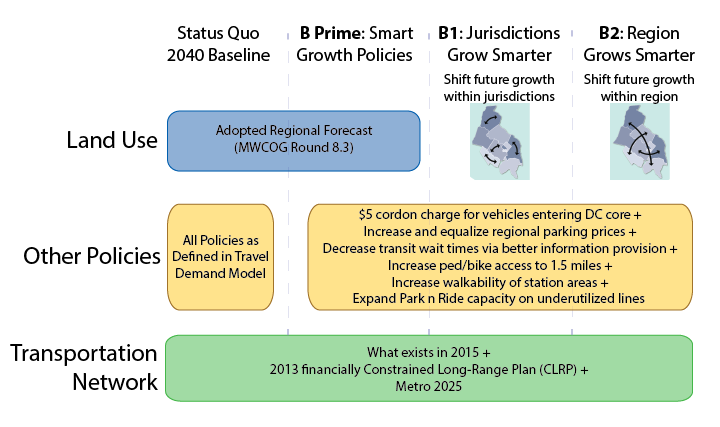 Scenario “B” looked at land use shifts and increasing the price of driving, and how those changes would impact Metro. *Note that Metro is not proposing that the region adopt a cordon charge, but it was tested as part of an analysis of how smarter land use and more transit-supportive policies could impact transit ridership, our operating subsidy, and other measures that support the region’s growth. Adding jobs and households in transit-served areas not only increases Metro ridership, but also reduces and may even eliminate the subsidy that local governments pay to support Metro, meaning lower tax bills for regional residents. In December of 2015, public and private leaders issued a call to action for the many jurisdictions in this region to start acting as one. We’ve actually been thinking about this for some time, and their announcement timed well with our desire to share perspectives on the following questions. What if the region’s future actually approached the goals of collaborative regional plans such as Region Forward and Place + Opportunity? 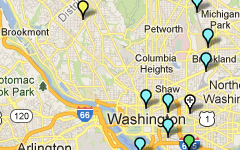 Would WMATA and the region benefit? Are there financial, social, quality of life and environmental benefits? Answers: YES, YES, and YES! Approach: Metro planners hypothesized that changing local jurisdictions’ and/or the region’s approach to future land use decisions, such as where to guide future jobs and population and expanding transit-supportive policies, could enable the region to better use the transportation system we already have rather than require us to spend tens of billions on new transportation projects. 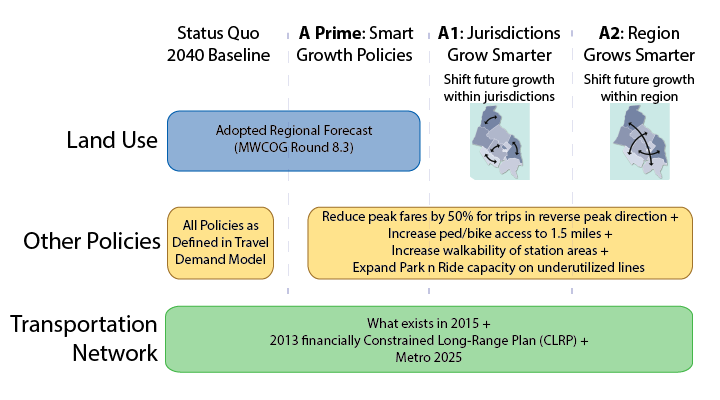 Planners developed three different scenarios (A, B, and C) that used the transportation system we already have, but modified future growth policies that determine travel patterns. The below post talks only about Scenario A, which had a specific goal to increase ridership on all segments of the Metrorail system, while minimizing the potential for overcrowding on any segment in the system. The image below shows how we built Scenario A and its three iterations (A Prime, A1, A2). Investing in the region’s activity centers that have high-capacity, high-frequency transit and enhancing them as proposed in the Place+Opportunity report is part and parcel to preserving the economic competitiveness of the region AND creating a financially-sustainable Metrorail system. WMATA planners posited that changes to local jurisdictions’ and/or the region’s approach to land use and other policies would enable better use of the transportation system this region already built rather than require it to spend billions on new projects. Money is not falling from trees to expand transit — the region hasn’t even agreed to fund enough rail cars to run all eight car trains! So, if the region can’t (or won’t) invest in transit to keep up with growth, then we need to carefully evaluate how the growth we are forecasting can use the infrastructure we already have. Can the region’s growth, rather than necessitate billions of dollars in new infrastructure, be thoughtfully planned to better utilize the roadway and transit systems we already have? What would that mean to the region, its finances, and to Metro’s operating subsidies that its funding partners pay annually? We developed an Executive Summary (pdf) that summarizes our approach and findings. These posts are infinitely more detailed, but you can certainly glean the key points from the Executive Summary. First and foremost, this study did not seek to develop an optimal land use or in any way socially engineer where future population and jobs should go. These are “what if” scenarios to provide context, data, and information to citizens, decision makers, and elected officials as the region grapples with future job and population growth, demand for transit, and development of walkable communities. This study sought to consider where future growth could go, and worked only with the regional growth anticipated to exist in this region in forecasts from 2020 through 2040. The modeling left existing jobs and population exactly where they exist today and was mindful that anything already in the development pipeline was far enough along to be assumed as “in place”. Second, we followed the place types defined in Place+Opportunity as they were identified, developed, and defined by local jurisdictional planning staff and the Metropolitan Washington Council of Governments (MWCOG). Why? Because we wanted this study to be as realistic as possible and remain true to the nature of the activity centers and the jurisdictions that informed their types and densities. Additionally, Place+Opportunity was completed recently (2014) and had significant support and direct input from the jurisdictions and the region. What if taxpayers could avoid spending hundreds of millions of dollars annually on Metro’s operating subsidy? Better yet – what if Metro could pay for itself and have enough left over to fund local transportation projects? What if better using the transit system we already have could help us achieve this? This isn’t just wishful thinking – it is possible. Recently some of the Washington region’s prominent leaders issued a call to action for this region to cease competing against itself if it is to secure its economic future. Their courageous statement coincided with findings from WMATA’s Office of Planning that actually put a price tag on that promise. And it’s a doozy. In case you missed it, at the Coalition for Smarter Growth‘s Smart Growth Social recently, Shyam Kannan, Metro’s Managing Director of Planning, gave a presentation on the impact of regional cooperation on the region’s finances and specifically, what this could mean for Metro and its ridership, operating subsidy, funding partners, and taxpayers. What he presented is the second half of ConnectGreaterWashington (CGW). As a reminder, the first part of CGW was a long range plan that identified infrastructure expansion needs across all transit operators in the region. It assumed that we would grow as the local jurisdictions have estimated in the cooperative forecast. This second part asks a different question. It challenges us to make do with the transportation system we have already built. Can the region’s growth, rather than necessitate billions of dollars in new infrastructure, be distributed differently to better utilize the roadway and transit systems we already have? What would that mean to the region, its finances, and to Metro’s operating subsidies that its funding partners pay annually? We’ve published online the WMATA presentation from last week’s Smart Growth Social. 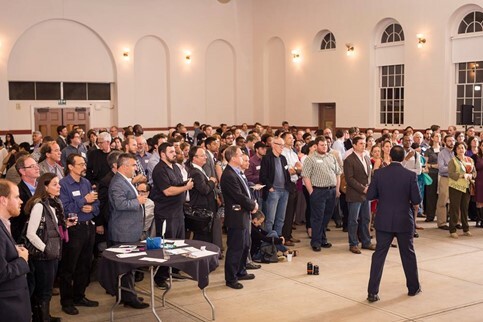 Last week the Coalition for Smarter Growth held their annual Smart Growth Social. Over 200 people were in attendance that evening and WMATA was honored to have the opportunity to share with the audience a preview of some ground-breaking research the Office of Planning has been conducting into the impact of Smart Growth practices on the region’s finances. On behalf of everyone who works towards a more sustainable and prosperous region, thank you for listening. We’ve gotten a ton of requests for copies of the presentation, which we have made available online. If you want to get more information on how smarter land use planning can and should be this region’s top transportation strategy, feel free to use the presentation or email us (planning@wmata.com) to stay informed as we release more information on ConnectGreaterWashington later this year.